In the interest of full disclosure I have to tell you that I hated bananas pre-op. They made my tummy hurt badly. I dunno why. But post-op…once I started trusting fruit again (new post-ops…tread carefully with fruit…it has sugar too although not sucrose and bananas have a LOT of sugar) I was drawn to bananas. I think I needed the potassium. At any rate, this shake got me over. I am going to post two ways of doing it. One is for days when I know I have been/will be on the carby-er side of things and want to keep my shake low-carb and the other is for days when I have the carbs to spend. Directions: Put everything but ice in a blender and mix well. Add ice and mix again. Now don’t get skeered! Carbs have their place in our eating plans! 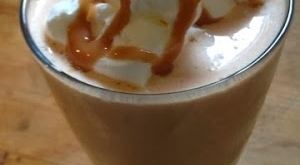 You drink this version about 30 minutes before you work out and trust me…you will be dynamo! Directions: put in a blender and whiz the bejeezus out of it! If you are worried about calories in the 2nd version you can omit the milk and go for a bit of water to get your blender going. The bananas maintain the creaminess of this shake. You might want to throw some ice cubes in there for good measure though. 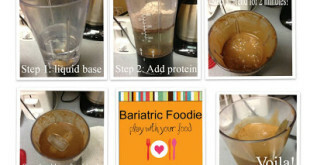 This shake is great as a meal replacement or as a dessert shake. But one word of advice. Don’t let the “McPeople” (normal stomached) population in your life taste this. You actually want them thinking it’s nasty…that way they will leave your protein swag alone. The minute they find out how yummy your shakes are, it’s over for you!